Located at Canyons Resort, this two bedroom, two bath condo features ski-in / walk-out access to the slopes. Furnished with comfort and luxury in mind, rich leather sofas and wood finishes allow for a cozy ski lodge feel. The kitchen is highlighted by granite countertops and custom knotty alder cabinets, continuing the warm feeling from the living space. A flat screen TV and DVD player is perfect for movie nights. Rest comes easy in the comfortable bedding in each bedroom, or nestle in near the fireplace on a chilly mountain evening. Scenic views can be enjoyed from your private patio. 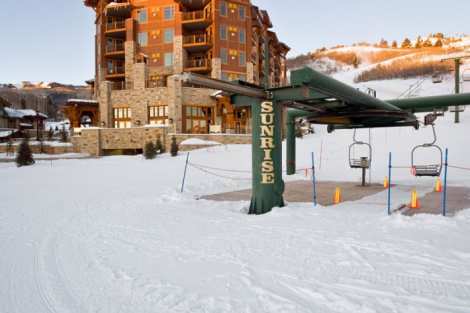 Located on the free shuttle route, getting around Park City is a snap, although parking is available on site should you choose to bring your vehicle. A common area fitness center, pool and hot tub are available for your enjoyment and relaxation. The Hyatt Centric will charge guests a $39.50 daily resort fee upon check in. This is not included in the price of your reservation online.